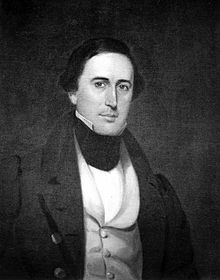 Born in Charleston, South Carolina, on August 22, 1807, William Henry Gist was the illegitimate child of merchant Francis Fincher Gist and Mary Boyden. He moved with his father to Union District, SC, in 1811 and came under the guardianship of his uncle, Nathaniel Gist, upon the death of his father in 1819. His uncle legally obtained the Gist last name for William Henry and sent him to Columbia to study law at South Carolina College (University of South Carolina). Gist was expelled in 1827 because he had led a boycott of Steward's Hall due to the living restrictions imposed by the trustees of the college. Nevertheless, Gist passed the South Carolina bar examination and returned to Union District to build Rose Hill Plantation on the land that his father had left him. Bricks were made on-site to construct the two and a half story Georgian style mansion, and it took four years to complete. He successfully managed the plantation, and it steadily grew in size and importance. Twice, Gist ran into difficulties with the law for alleged involvement in duels, but both times escaped without punishment. On May 13, 1828, William Henry Gist married Louisa Bowen, daughter of George Bowen and Tabitha Bowen. They had one daughter before Louisa died. He married a second time on October 10, 1832, to Mary Elizabeth Rice, daughter of William Rice and Sarah Pines Herndon Rice. They had eleven known children. On December 12, 1848, he was elected Lt. Governor and yet he did not give up his senate seat. On December 10, 1858, William Henry Gist was elected as the next governor of South Carolina, and he served until December 17, 1760. His home at Rose Hill Plantation served as the Governor's Mansion during his term as governor. Gov. William Henry Gist was bitterly opposed to the presidential candidacy of Abraham Lincoln in November 1860, and he had discussed with governors of other Southern states what course of action they would take if Lincoln were elected. Gov. Gist believed that because the United States of America was created through a compact among sovereign states, the states retained their sovereign powers and could leave the Union if the federal government failed to protect their rights and privileges. Receiving assurances from the governors of Florida and Mississippi that they would follow South Carolina's lead, Gov. Gist called for a secession convention to be held in Columbia on December 17, 1860, his last day as governor. The convention was moved to Charleston because of a Smallpox outbreak in Columbia, and William Henry Gist was one of the signers of the Ordinance of Secession on December 20, 1860. Florida and Mississippi signed their own Ordinance of Secession in January 1861. The creation of the South Carolina Executive Council in 1861 provided William Henry Gist an opportunity to participate in the state's wartime activities of the Civil War. He was in charge of the Department of Treasury and Finance and later the Department of Construction and Manufactures, but the dissolution of the South Carolina Executive Council in September 1862 ended his involvement in the politics of the state. William Henry Gist had two sons who fought for the Confederacy. His eldest son William was killed by a Union sharpshooter outside of Chattanooga, TN in 1863. Gist was the cousin of States Rights Gist, a Confederate Brigadier General who died leading a charge at the Battle of Franklin, TN in 1864. After the Civil War ended in 1865, William Henry Gist took an oath of allegiance in Greenville, SC, and received a pardon from President Andrew Johnson. He returned to Rose Hill Plantation, which had survived the Civil War and Sherman's March to the Sea because the Broad River was in flood stages and the Union troops could not get through. William Henry Gist remained at Rose Hill and rented out the land to sharecroppers. He developed appendicitis and died on September 30, 1874. Gist is buried in the family plot near the Rose Hill mansion. William Henry Gist was born in Charleston, South Carolina. He attended South Carolina College, where he later served as a trustee. Owner of Rose Hill" plantation, he also studied law. He was a member of both the South Carolina House of Representatives and the South Carolina Senate from 1844 to 1856. Although elected Lieutenant Governor by the state legislature in 1848, he failed to qualify and therefore remained in the Senate. A strong supporter of secession, as governor he wrote to all cotton states except Texas to inform them of the likelihood of South Carolina's withdrawal from the Union and to request their cooperation. He also kept the state legislature in special session to await the outcome of the 1860 presidential election, proposing that a convention be called and the militia strengthened in the event of Abraham Lincoln's election. Gist left office the day that the Secession Convention convened and signed the Ordinance of Secession as a convention member. He was later appointed to the Executive Council, which superseded the state's regular government, and served as chief of the Department of Instruction and Manufacturers.